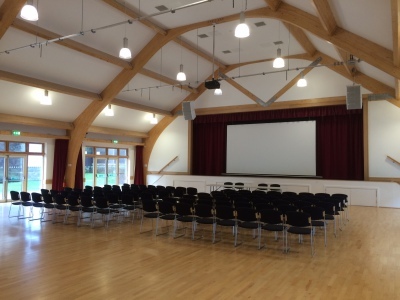 The Crowborough Community Centre is a venue which can be enjoyed by everyone and is suitable for hosting a wide range of community, business and private events. We are here to provide you with a cutting edge venue and facilities, whatever your needs. Come and talk to us about your event, class or business activity and see what we can do for you. For more information about the facilities we offer, please download our e-brochure, take a virtual tour of the Centre or have a read through our Frequently Asked Question document using the links below. The e-brochure gives the specifications for all our rooms. Room hire from £10.60 per hour! If you make an event booking with us, we will promote your event on our website, Facebook and Twitter - free! Digital Signage is also available in our Foyer which can be hired for a small monthly subscription. Please enquire at the Centre. * The Centre is also staffed at weekends according to our events diary, so it is worth giving us a call at the weekend if you have an urgent enquiry. Please read "Important information for hirers" below. Please note that all our room bookings include use of A/V equipment as required, provision of tables and chairs and room set up according to your instructions. We will always do our best to accommodate any special requirements. The playing of copyrighted music is covered by the Centre's Performing Rights Licence. No additional charge is applied to bookings made with the Centre. If you are booking a room please take time to read the documents here. By signing our booking confirmation, or confirming a booking by email, you are agreeing to our Terms and Conditions of Hire, Health & Safety and Fire and Safety Requirements policies. Please note that we will set up tables and chairs to your specification (depending up how busy the Centre is, this may be during your booking period), but your booking must include all the time that you and your clients need to access the room(s). This must include your own set up and clear up times and is not necessarily the time of your event. Please do not assume access to your room before your booking period. All connections to Audio/Visual equipment are via HDMI, so please ensure that your equipment has this capability. If in doubt, please contact the Centre in advance of your booking. • Where processing enables us to enhance, modify, personalise or otherwise improve our services/communications for the benefit of our members, staff and volunteers. • to provide postal and e-mail communications which we think will be of interest to you. Whenever we process data for these purposes we will always keep your Personal Data rights in high regard and take account of these rights. You have the right to object to this processing, and if you wish to do so please inform us at our registered address. Please bear in mind that this may affect our ability to carry out the tasks above for your benefit. If you specifically wish to unsubscribe from e-mails sent by The Crowborough Community Centre please select the "unsubscribe" option at the foot of the-mail.